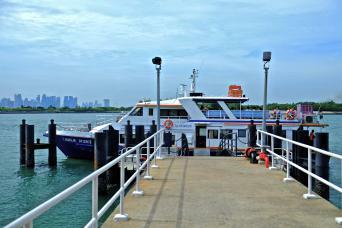 Looking for the most convenient way to travel between Kusu Island and St John Island in Singapore? Look no further. Choose to travel with ferry services provided by Singapore Island Cruise through a few simple steps we have prepared for your convenience here on Easybook. For those who are planning to visit the famous temples in Kusu Island or to St John Island to escape the busy city life, Singapore Island Cruise is here to help you get there safely with their trusted transportation at affordable prices. Singapore Island Cruise or also known as SIC in short is the only company that is able to ferry travellers to Kusu Island and St John Island from Marina South Pier. There will only be one trip per day on weekdays while the weekends have about four trips per day on the ferry schedules to capture the weekend crowd. Travellers have the choice to arrange the order of the trips according to your schedule, especially if you wish to go island hopping. For those who have plans to travel to the other southern islands in Singapore, you can also book the private charters with SIC. Singapore Island Cruise allows you to customise exclusive trips to fit your plans upon request. All Singapore Island Cruise will depart from Marina South Pier and they ferry in a loop. First the ferry will stop at St John Island which takes about 30 minutes, then another 15 minutes from St John to Kusu Island. There is the option to either book this trip that goes according to this route, or purchase the ferry ticket separately for individual stops as well. The ferry tickets include both departure and return trips already. St John Island - Don’t just admire the view, go on a private yacht cruise to enjoy the beautiful view. Travellers are also able to sign up for a nature walk or just take it easy with a picnic by the beach. Animal lovers would definitely enjoy interacting with the stray cats that has been populating in this island for many years. Kusu Island - There are plenty of spiritual places to visit such as the famous Da Bo Gong and Tua Pek Kong. At the top of Kusu Island are three holy shrines or more known as kramats, that people will climb to pray for good wealth, health, marriage and harmony. Take the weekend off to explore both the islands in Singapore with Singapore Island Cruise’s ferry service with your family and friends. Search the ferry schedules of your choice on Easybook without having to leave the house or office to get the ferry tickets. Don’t forget to download our mobile app to your phones too for a chance to book Singapore Island Cruise tickets at the palm of your hand!